Late in the night on January 13, 1894 townspeople were awakened to the church bells sounding the alarm that downtown was on fire. Firefighters struggled with their equipment in gale-force winds as the temperature dropped to 16 degrees below zero. Saturday morning at about 1:30 o’clock, night operator Arthur Howard at the Boston and Maine R.R. station had his attention attracted by a bright light in the direction of Central Street. He soon found that the cause of the light was a fire in Jewett’s block, and gave the alarm to Police Officer Franks Smith and to Charles Currier his assistant operator. They at once gave a general alarm and aroused the town. The citizens tumbled out from their beds and dressed, and faced what perhaps was as wicked a night for a fire as Ipswich has ever seen. The thermometer was at 8 below zero, and the icy wind blowed a hurricane. The firemen responded promptly, and soon were at work, but with no apparent chance to top the flames. Jewett’s Block, a three story building, was a mass of flames, and Central Block was also on fire. The buildings burned like paper, and in a short time, Mrs. L. K. Jewett’s residence and Wilde’s Block were on fire. The next to go was the Heard property on the corner of Central St. Carleton Copp’s house and George Wilde’s house were also on fire. In an incredibly short time the whole lower end of Central Street was ablaze. The sparks from the burning buildings were swept by the wind toward the southern part of the town, and men shuddered to think of the ruin that was sure to come. It certainly looked as though half of the town ws doomed. The firemen were doing all that men could do, but it was at once seen that help must be obtained. 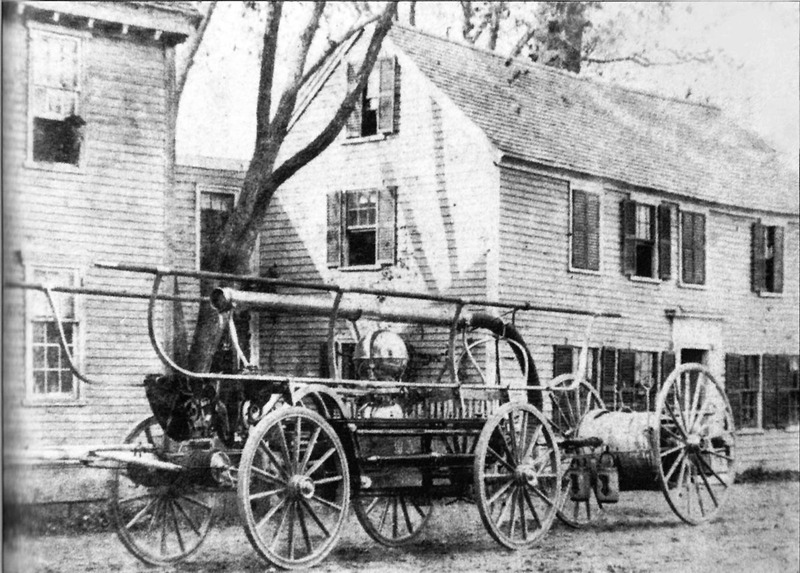 Engineer Barton telegraphed Salem, Beverly and Newburyport for assistance, and Mr. Martin, agent of the Ipswich Mills, also started his powerful fire pump. The entire department and two streams from the mills were concentrated on the Heard property, and the buildings in the rear of the burning blocks, with the intention of checking the flames at this point. It was a good move, and was successful. About 3 o’clock Steamer No. 3 and Hose No. 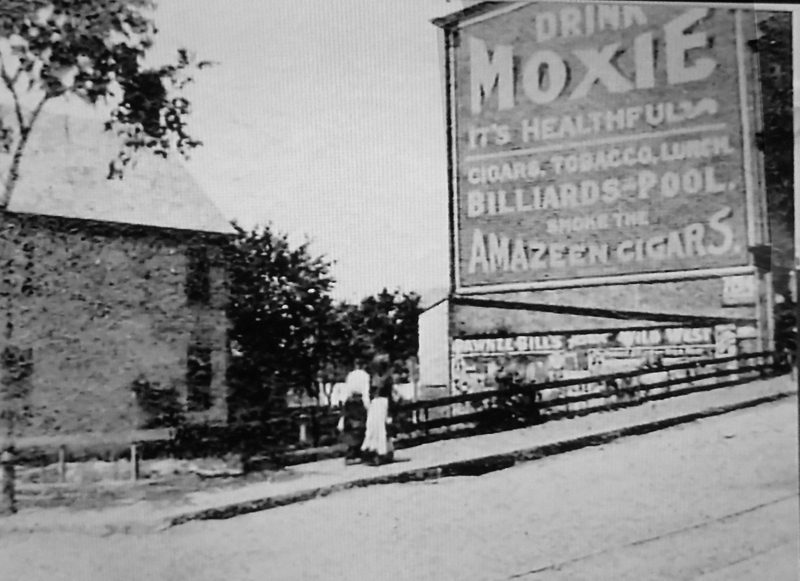 2 arrived from Salem, and located at the rear of J. Holland’s shoe store, taking their water from the river. The battle against terrible odds had been fought and won at 3:30, and the fire was under control. The fact that the roofs of the buildings were covered with snow undoubtedly saved many buildings and prevented great loss. The firemen worked like heroes. those at the brakes pumped with a will, and pumped for hours. Many volunteers assisted them. At six o’clock in the morning the hosemen were covered with ice from head to foot. The neighbors near the fire and Mr. T. E. Condon did everything to assist the men. Hot coffee and other warm drinks were supplied in quantities. Ipswich people have reason to be proud of the work of the firemen. The cause of the fire is unknown, but it is the general opinion that must have started in the upper part of Jewett’s block. While the fire was in progress, a lot of powder which was among Mr. Goodhue’s stock, exploded. The noise was terrific, and the sparks and timbers were sent heavenward. As might be expected, the scarcity of water prevented the saving of some of the property. The water supply question was discussed by the crowd during, and after, the fire and it is said that many converts for water were made. It is thought that at least one half of the loss Saturday morning could have been saved by a water supply. The Salem Fire Department will present no bill for their services. They did excellent work and Ipswich expected to pay for it, but Salem generously refuses to accept pay. The general expression from old firemen who have visited the ruins is that an almost impossible feat was accomplished when the fire was stopped at Plouffs store. A view of Central Street from the bottom of North Main Street on January 15, 1994. Some of the buildings are still smoking. The Tyler Building was the last to be built after the fire. For thirteen years there was an empty lot on the corner, nicknamed “Burdock Park” by impatient locals. 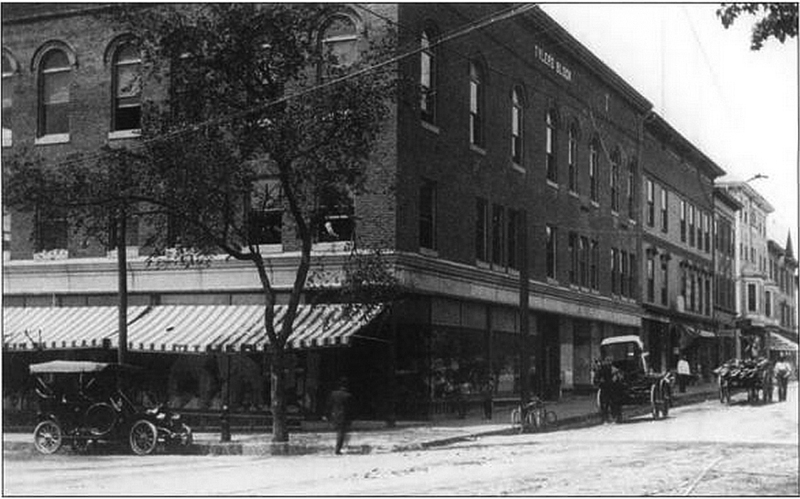 The corner remained deserted for 13 years until the Tyler Block was built in 1906. You can see the trolley tracks in the bottom right corner. The Tyler Block looks much the same today. The Five Corner Cafe and Deli is now located at the corner. 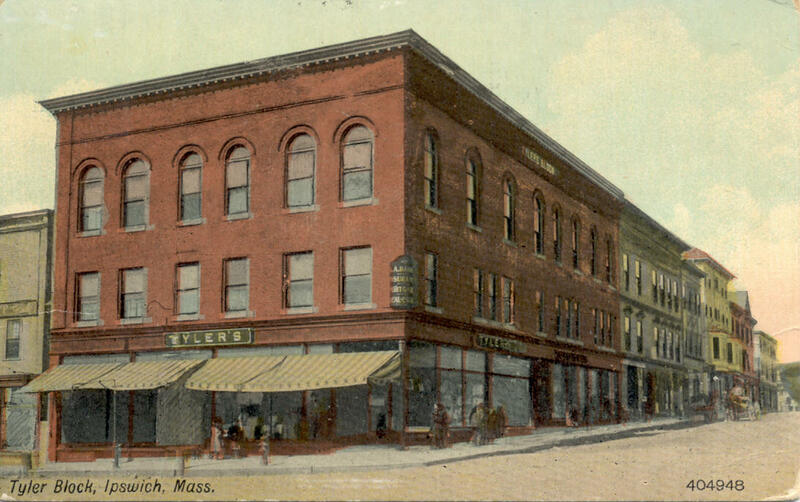 The newly built Tyler Block, 1910. Note the trolley tracks. 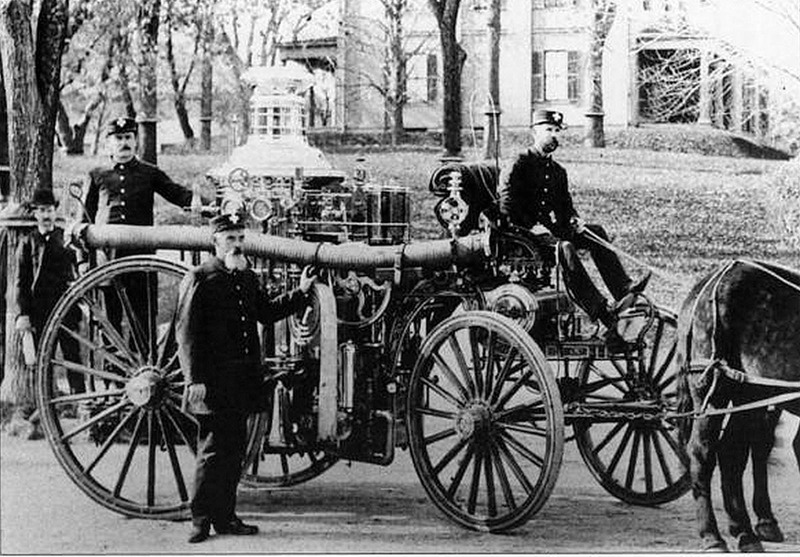 Fire protection before the Twentieth Century was supplied by private fire companies with hand-pulled hand tubs and horse-drawn hose wagons. 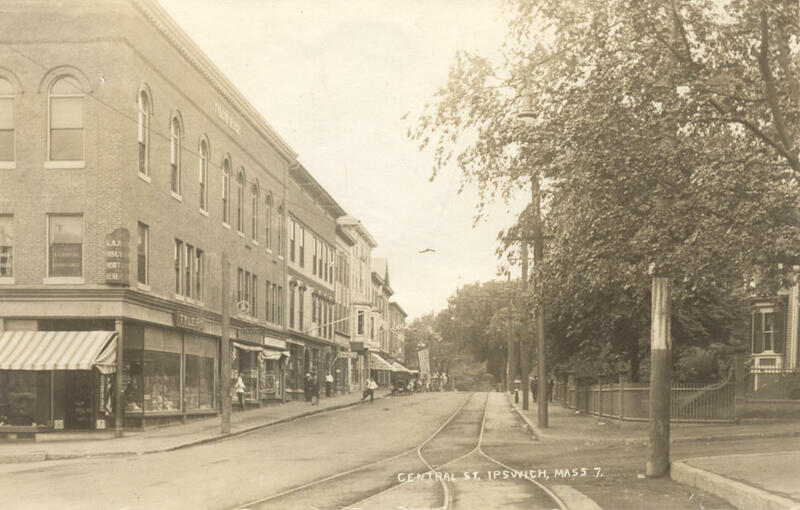 There were three hand tub companies, operating the “Warren” on Warren Street near Meeting House Green, the “Neptune” at Lords Square and the “Torrent” in the Candlewood neighborhood. The Warren hand tub and a hose reel. The town had for years defeated town meeting warrants to purchase motorized equipment. Harold Bowen wrote that farmers on Linebrook Road were concerned that the town would draw too much water from Bull Brook. The Torrent crew arrived first but the equipment had frozen solid. They rolled the hoses to the mill and connected to the water lines there. After about an hour a steamer arrived at the Depot on a flatbed rail car from Salem. With the gale force winds that night, the fire raged out of control. 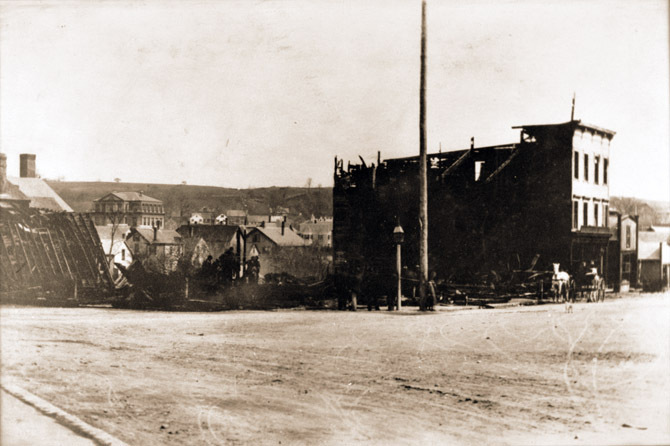 By the next morning all of Central Street from Market Square to Hammatt Street had burned to the ground. The fire was believed to have started in the photography studios of George Dexter. 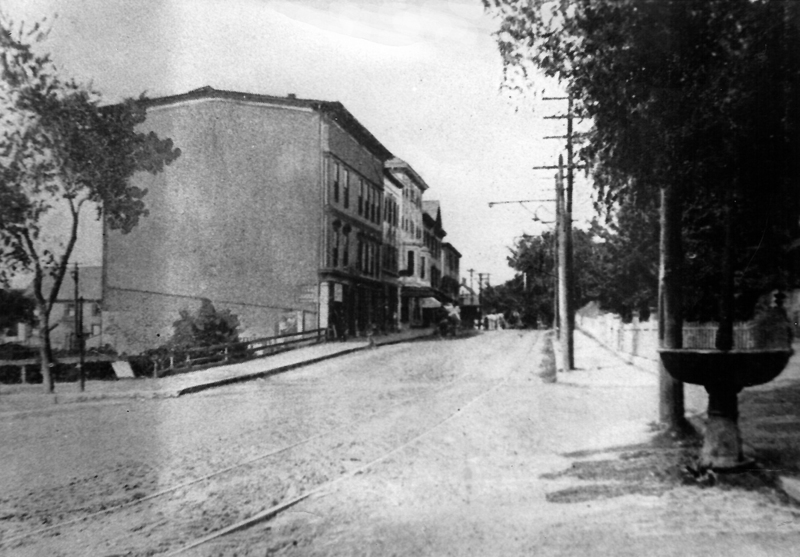 The ancient William Heard house at the Corner of Market and Central Streets was destroyed but the rest of Market Street was unaffected. On April 17 of the same year the Damon Block on the other end of Market Street burned. The building had served as the court house on the North Green until 1854 before being moved downtown. Firefighters were already battling a blaze at Fall’s coal yard and had to return to town. After that building burned, a special town meeting was hastily called and a town water system was approved by an almost unanimous vote. The Bull Brook/Dow Brook Reservoir system was begun that summer. When the fiscal year closed in 1895 the town had 12 miles of water mains with 600 taps to consumer’s property lines and 107 hydrants. The financial cost to the town as of Jan. 1895 was $137,930 with a bonded debt of $130,000. 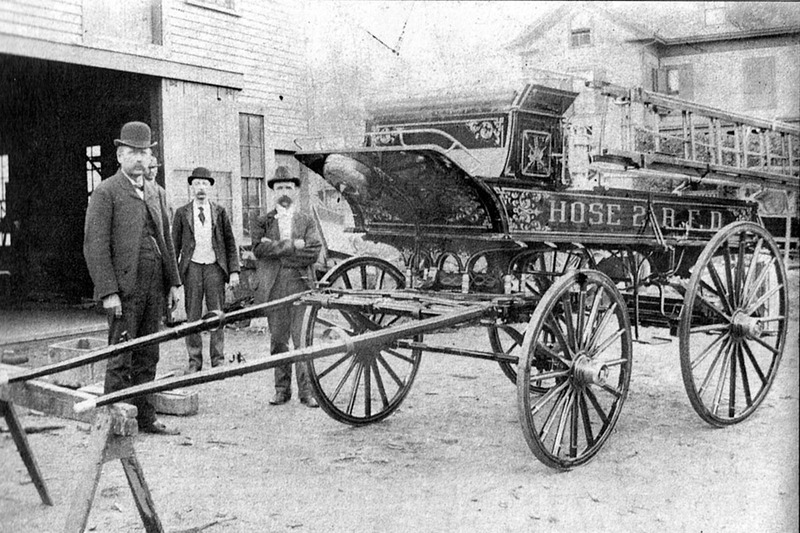 The town purchased the fire steamer “Masconomet” for $3200 and the Warren Fire Company was disbanded. 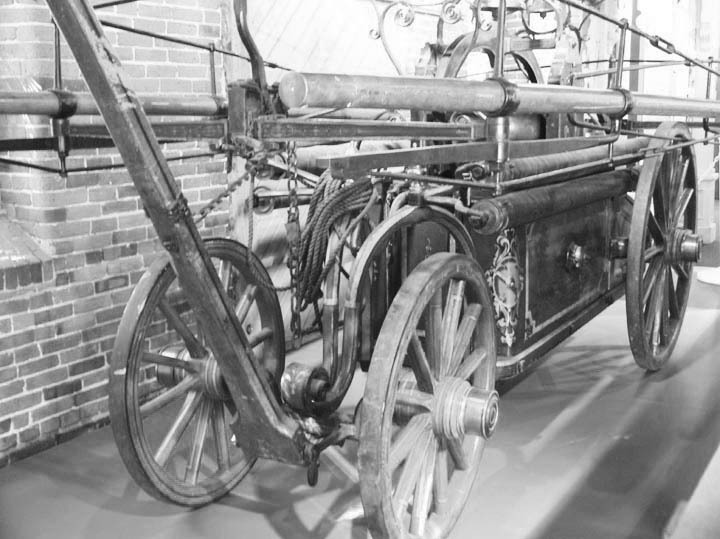 The town’s first motorized fire truck was purchased in 1912. 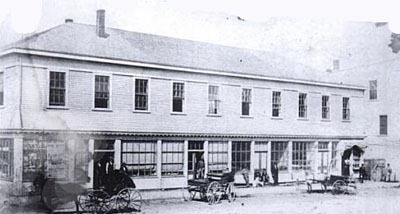 The Masconomet was the town’s first horse-drawn pump. A new three floor Damon Block was constructed and was considered by many to be the most beautiful building in town. Over the years it was home to the New England Telephone Company, John Blake’s drugstore, the French Society of Artisans, the Cash Division Grocery store, Clapton’s Wholesale Vegetable Store, Scahill’s Barber Shop and Damon Furniture. 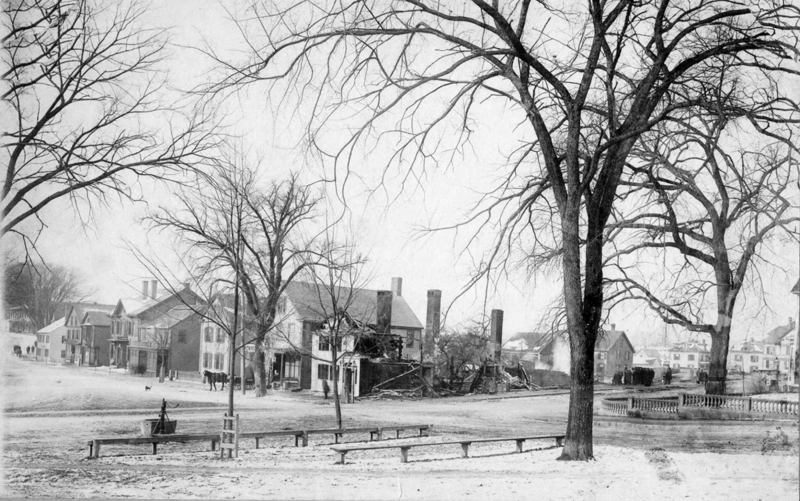 The Damon Block after the 1894 fire, completely destroyed. Photo by Edward Darling, courtesy of Bill Barton. Note the Manning School in the background, and Town Hill almost completely bare of trees. The Torrent handtub could send a 150′ stream of water. Shown here: Torrent #5, Manchester NH. The 1897 Town Report includes the following Report of Engineers of the Fire Department : “Number of alarms, 5. Value of property where fire occurred $53000 00. Number of men in department, 70. Warren engine sold for $280.00, 56 lbs. old brass sold for $3.50. Bought 1000 feet new woven hose, first quality, $550.00. Inventory same as last year except 1000 feet additional hose making 5600 feet. Millett & Woodbury have permitted us to use their whistle as a fire alarm, and have kept a steam pressure sufficient to blow at any time. The department is well equipped, and the best of harmony prevails between the members. That they are efficient is shown by the small losses. We recommend the appropriation of $1000 to operate the department the ensuing year.” In 1946 the Damon Building was severely damaged by fire and the building was reconstructed without the third floor. 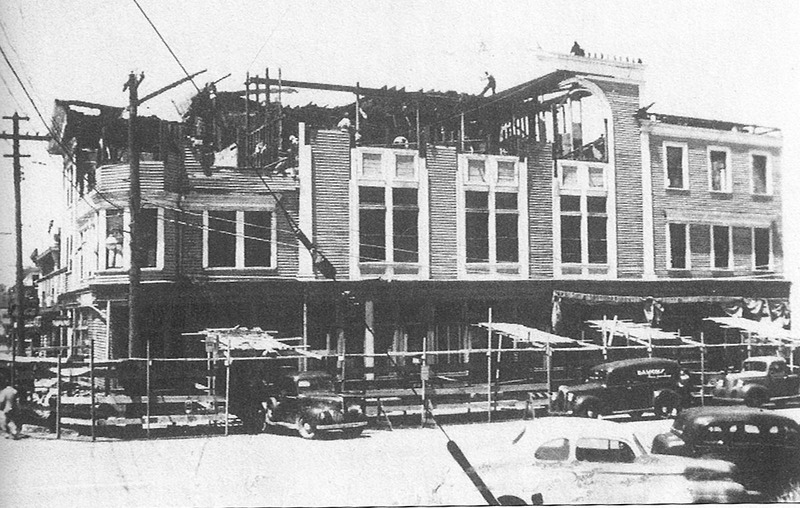 The building was totally destroyed in a a 1982 fire and the brick building we see today at the corner of Depot Square and Market Street was built. 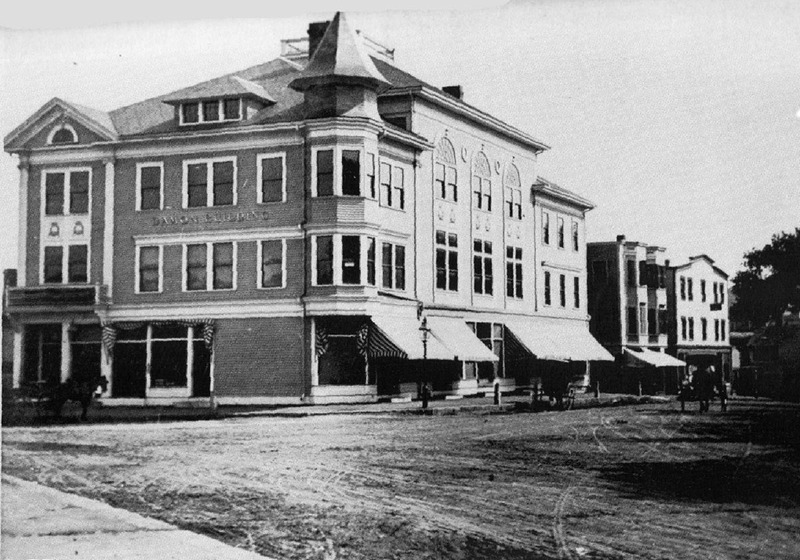 A beautiful new Damon Block was built at the corner of Market Street and Depot Square after the 1894 fire. It suffered two fires and in 1982 was replaced by the current brick building. A large underground cistern in front of the Ipswich Library held thousands of gallons of water, from which the firemen drew water with their hand-pumped fire engines. 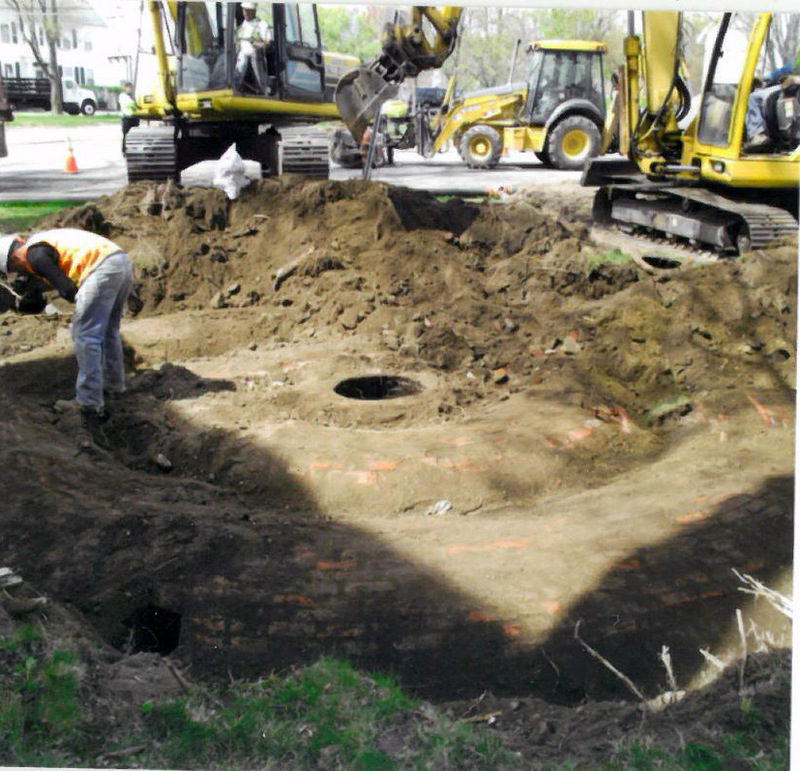 It was uncovered and demolished to lay water pipes when the North Green was redesigned a few years ago.